Wait! My seeds are growing upside down! What Size Container to Use? 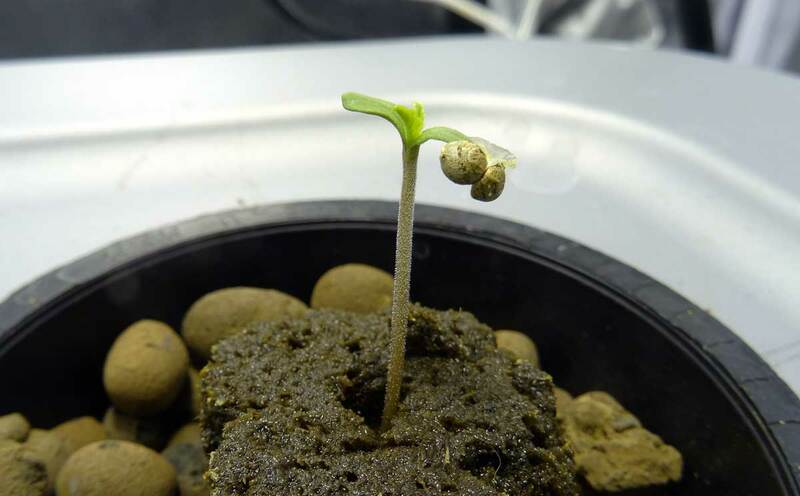 Cannabis germination is the process of getting your seeds to sprout, and you know sprouting has occurred when a little white tendril pops out of the seed. 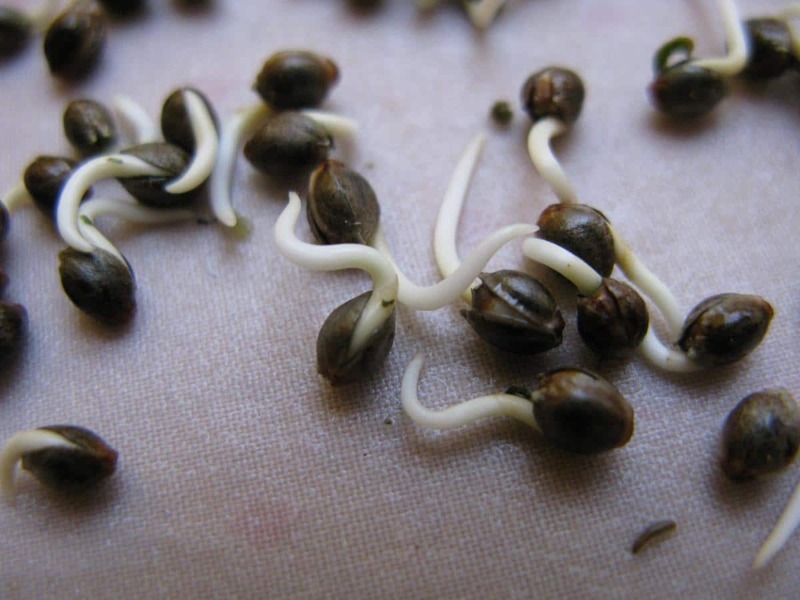 The little white tendril that emerges from a cannabis seed during germination is your plant’s first root, known as a “taproot.” All other roots made by your cannabis plant in its lifetime will sprout from the taproot. 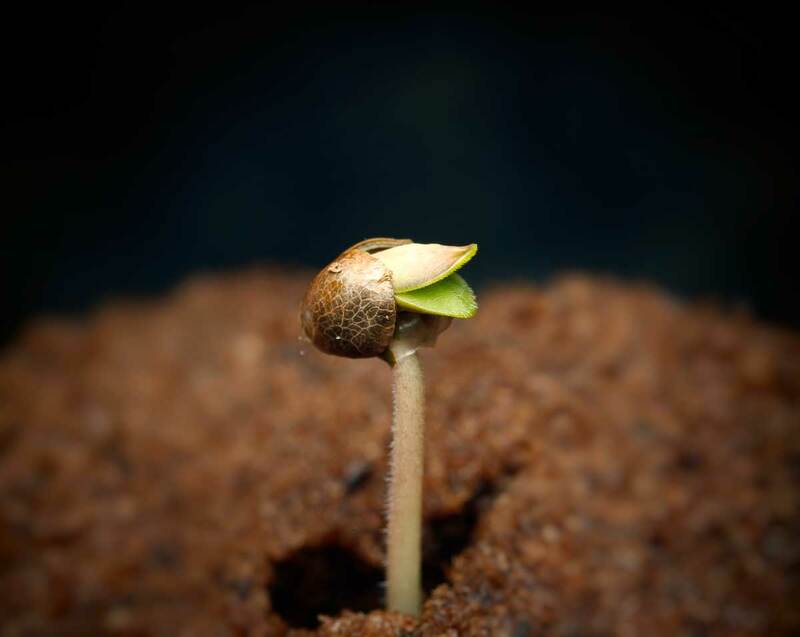 The taproot – and maybe a few tiny early offshoots of the taproot – will get longer and longer, pushing the seed up, and after the shell breaks through the surface of your growing medium, the first leaves (these first round leaves are known as “cotyledons”) will emerge from inside the cannabis seed. The next set of leaves after the cotyledons are your plants first “true” leaves and will have jagged edges (serrations). 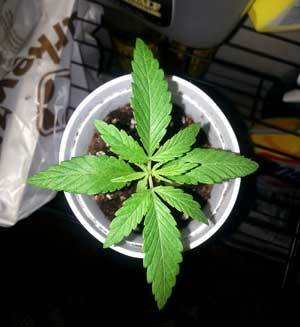 At least, they are the first leaves that your seedling cannabis plant has grown all on its own, unlike the cotyledons which were already formed in the seed. Cannabis seeds can be expensive, don’t waste your seeds with bad germination methods! 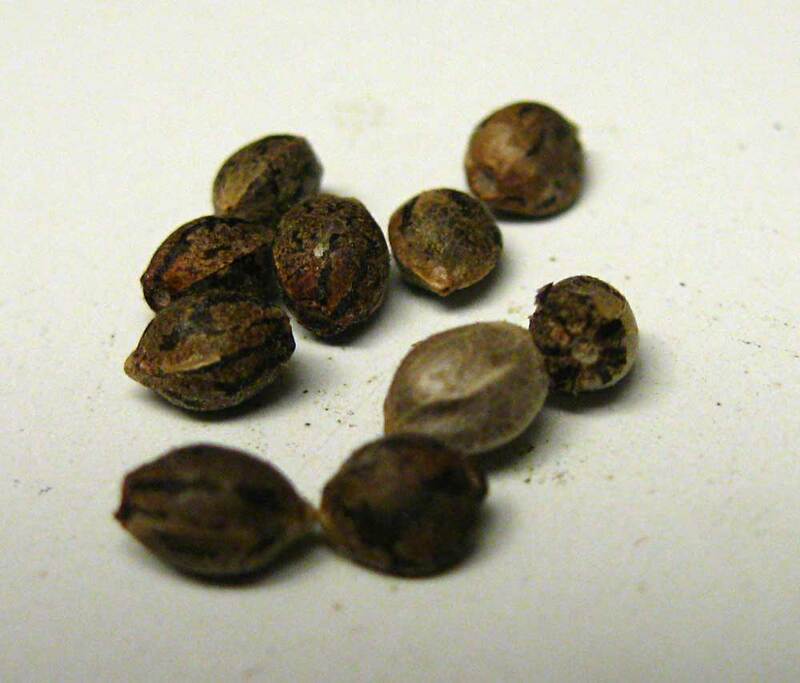 What Do Marijuana Seeds Need to Germinate? Moisture – Keep things moist but not soaking (you can soak hard seeds for up to 24-32 hours, but do not leave seeds soaking in water for longer than that). Peace – Seeds need to be left alone while you’re waiting for the taproot to show up. Warmth – Keep things warm to get the best germination rates, but not too hot! Think springtime. Seeds can definitely germinate in cooler temps, but germination tends to take longer when it’s cool. Gentle – Be careful when checking seeds, and treat them gently when you have to move them. Avoid touching their white root if possible; the taproot is very fragile and easily snaps off! 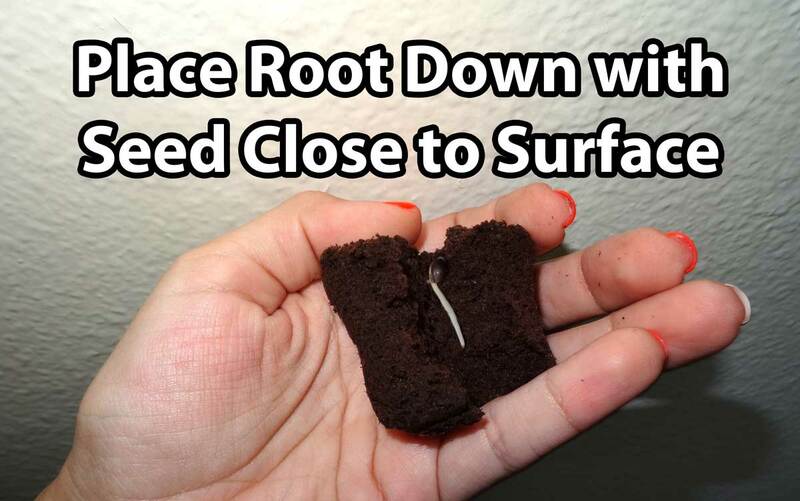 Plant Root Down – When planting germinated seeds, point the white root downwards into the growing medium to prevent the seedling from having to reorient itself. Plant Knuckle Deep – When planting germinated seeds, they don’t have to be placed too far under in the growing medium, about a half inch to an inch (1.3 cm – 2.5 cm) down from the surface of the medium should be enough. 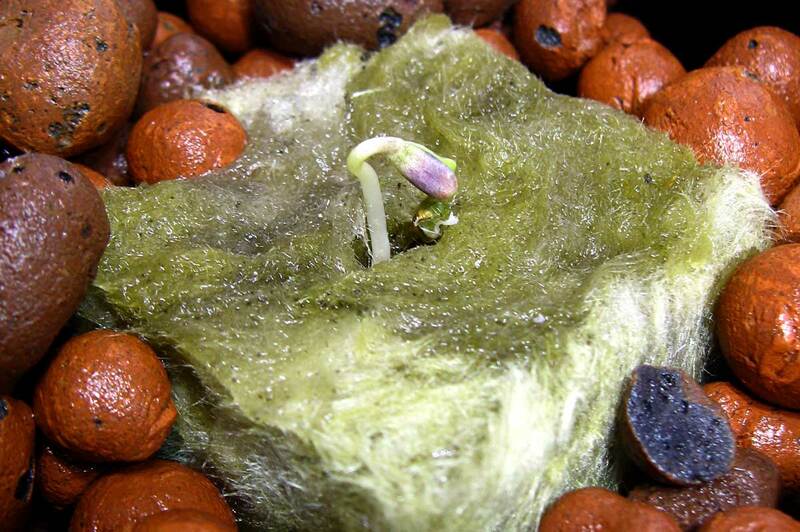 When germinating cannabis seeds, think springtime conditions. In the wild, your cannabis seeds would germinate in the spring so they can be ready to take full advantage of long summer days! Never let your young sprouted seeds dry up! 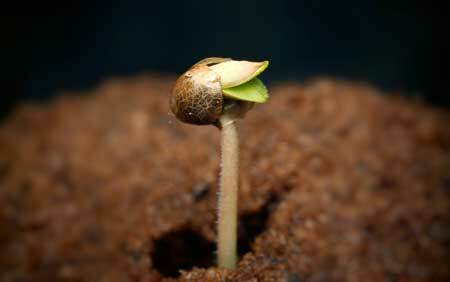 The main signal that tells a marijuana seed to start sprouting is the presence of moisture and heat. The combination of warm and wet (aka spring conditions) “tells” the seed to start burrowing their main root (called a taproot) through their shell. If a seed’s root breaks through the shell and the water around has dried up, your seedling will die. Plain and simple. Seedlings are fragile at first. Once sprouted, the roots need to stay constantly moist to stay happy and healthy. 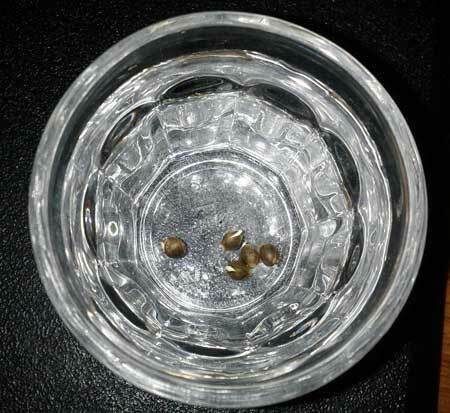 It’s important to make sure the seeds have access to water the entire time during germination, no matter which cannabis germination method you end up using. Seeds germinate best in warmer temperatures and young marijuana seedlings do better with higher relative humidity in the air. When seedlings are young, they grow faster and healthier when they can absorb moisture from the air through their leaves while their roots are still developing. Dry air won’t kill your seedlings, but it doesn’t make things better. Again, think springtime conditions! 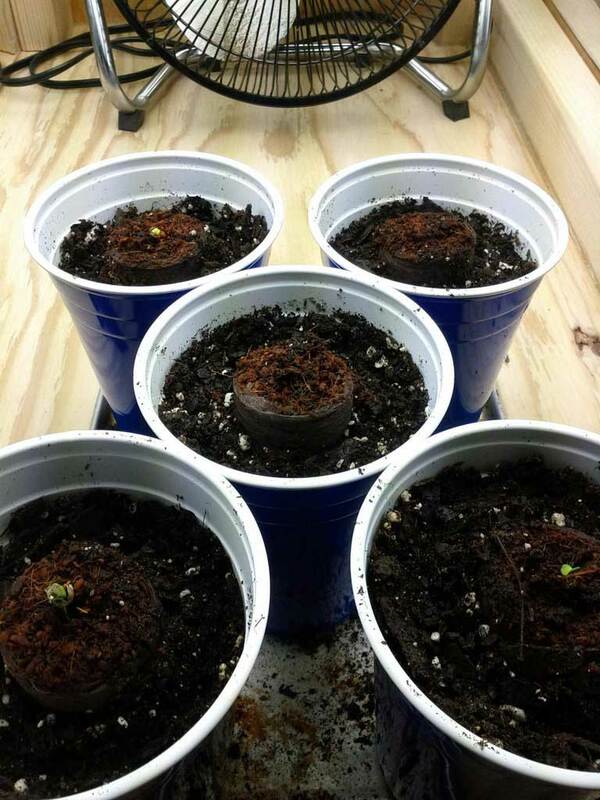 You can use an incandescent bulb (or two) placed over the marijuana seed germination area to help keep things warm. Incandescent bulbs are the opposite of what a grower typically wants: they can’t be used as grow lights, but they’re great at generating heat. Some people will also place a heating pad (the kind you get from a garden store for seedlings) underneath seeds to help aid germination. Basically, you want to make sure any seeds or sprouts are kept warm and moist at all times, that their roots are unexposed to light, and that they get planted right away. 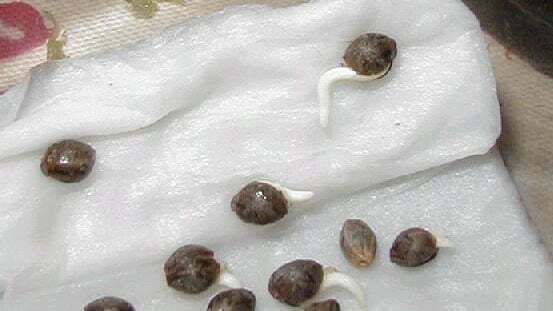 There are several different methods to germinate your cannabis seeds, and in this article we’ll go through some easy techniques that have proven to be effective. Generally, pale-green or white seeds will not germinate, but most dark seeds will germinate when given good conditions. I used to believe that marijuana seeds were only “good” if they were extremely hard and very dark. One of the first tests I heard to check new cannabis seeds for viability was to try to crush them between my fingers. If the seeds could be crushed, they weren’t good, or so I was told. This has proven to be absolutely terrible advice! Some of the best plants I have ever grown have emerged from seeds which were flimsy and could be crushed between my fingers. As long as you provide great marijuana germination conditions (as explained above), I’ve found that a lot of seemingly “weak” seeds germinate and produce amazingly hardy plants and great buds. I do not believe the health of the plant is directly tied to the apparent “health” of the seed. If the seed germinates, it’s a good seed! As long as a seed germinates, it’s a good seed! One of the best cannabis germination methods is to use specifically-made starter cubes and seedling plugs. These plugs make cannabis germination easy. You simply place the seed in the cube or plug, add water as directed, and seedlings automatically get the perfect conditions for germination. Each cube or plug already has a hole specifically for you to place your seed. Just stick your seed into the precut hole and pinch the top closed a bit with your fingers. Don’t worry, you can’t mess this part up 🙂 As long as the seed makes it in there, you should be good. This is one of the easiest germination methods and doesn’t leave a lot of room for error. Cannabis seeds and clones can be expensive, and sometimes we have genetics we just can’t afford to lose. When that’s the case, germinate your cannabis with one of the following recommended options to ensure as close to 100% germination rate as possible. Which Starter Cubes Work Best for Germinating Cannabis? Rapid Rooters are easy to work with – you just stick your cannabis seed in the Rapid Rooter (pointy side down), keep your seed warm and slightly moist, and let the Rapid Rooter do its magic. Sprouts emerge and roots appear in just a few days. 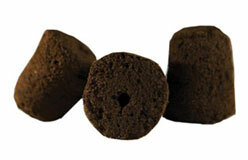 Rapid Rooter starter cubes are suitable for all growing methods, including hydroponics, coco coir and soil. They work for every setup and come from General Hydroponics, a trusted company (the same one used by NASA) which is known for the quality and consistency of its products. I highly recommend using Rapid Rooters over any other starter plugs. They are less prone to problems and work great with any growing medium (including hydroponic systems). After opening the package, you only have a week or two before they dry out, so if you’re only germinating one or two seeds, you’ll end up having to throw many of the Rapid Rooters away. These are round on bottom instead of being a cube, which means they cannot stand up on their own. These are best suited to a hydroponic setup where the Rapid Rooter will be placed directly in the final destination. In our hydroponic setups, we’ve had near 100% germination rates with Rapid Rooters, better than any other seedling cube we’ve tried. This type of Rapid Rooters comes in a mat of (usually 98) Rapid Rooters. All the individual Rapid Rooters are sectioned off and have a hole for the seed, but they must be cut or pulled away from the complete mat. Unlike the type of Rapid Rooters that comes in a bag, these ones are made into cubes and are flat on the bottom so they can stand alone. This makes them good for germinating in a shallow pool of water where the cubes need to be able to stand up on their own. 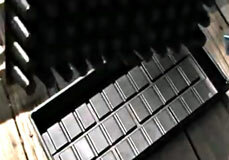 The Rapid Rooters tray is perfect for seeds or clones. Allow your young plants to sit in the tray with water until their roots are well formed and ready to be transplanted to your final destination. The standard size tray fits most humidity domes. You can refill the tray with Rapid Rooters from the bag or mat. As you can see in the pictures below, the Rapid Rooter Tray comes packaged up. Once you open the package, you will see 50 Rapid Rooters already set in the tray. The resting place for each Rapid Rooter has a hole on the bottom so water within the tray is wicked up. The top part comes apart from the bottom. 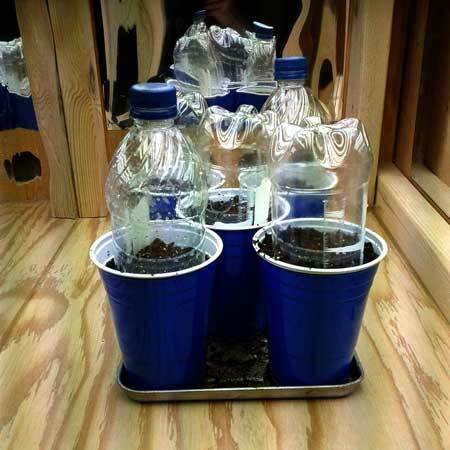 Just add you seeds and pour some water into the tray – the Rapid Rooters will do everything else for you. Just add water and seeds, that’s it! It does not break down naturally and therefore after Rockwool is created, it will remain in that form basically forever, filling up landfills without breaking down for thousands of years. 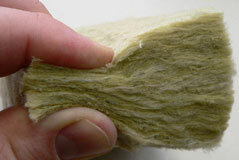 Rockwool is dusty and needs to be rinsed thoroughly before use. Little pieces of Rockwool and dust can easily get in your eyes, skin and mouth. Small strands or fibers can get lodged in your lungs if you breathe in Rockwool dust, and it’s unknown if these fibers can ever get out again. Protect yourself! Always use a mask, goggles and gloves when working with Rockwool. 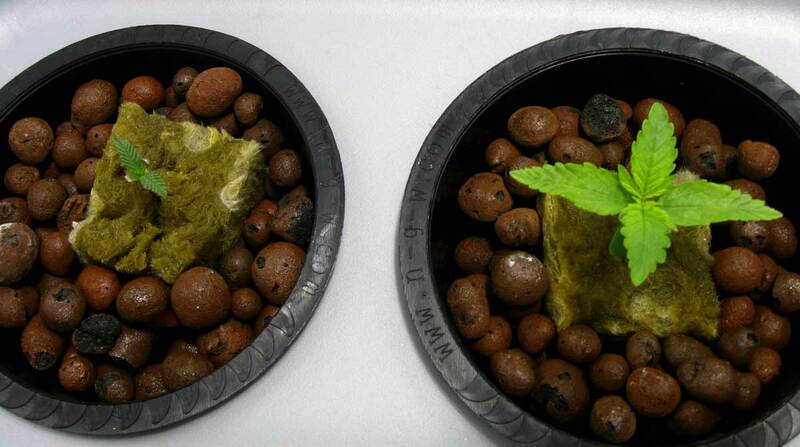 New Rockwool cubes have a high pH – too high for healthy cannabis seed germination. Therefore it’s important to thoroughly rinse Rockwool cubes in pHed water, then let them soak in pHed water overnight before use. Since Rockwool holds onto a lot of water, after soaking they should be given a few days to dry out before planting seeds or making clones. Rockwool can be difficult to germinate marijuana seeds in, so I recommend most beginner growers sprout their seeds using another method like Rapid Rooters (mentioned above) which can also be used in hydroponic applications but are less prone to germination problems. 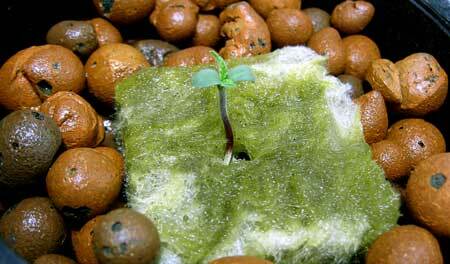 Many growers have placed seeds in Rockwool cubes, only to wait for weeks and never see seedlings appear. Some growers seem to have no problems, yet many other growers suffer through very poor germination rates. Some seed companies will not honor seed germination guarantees if the grower uses Rockwool because it is notoriously bad for germination. 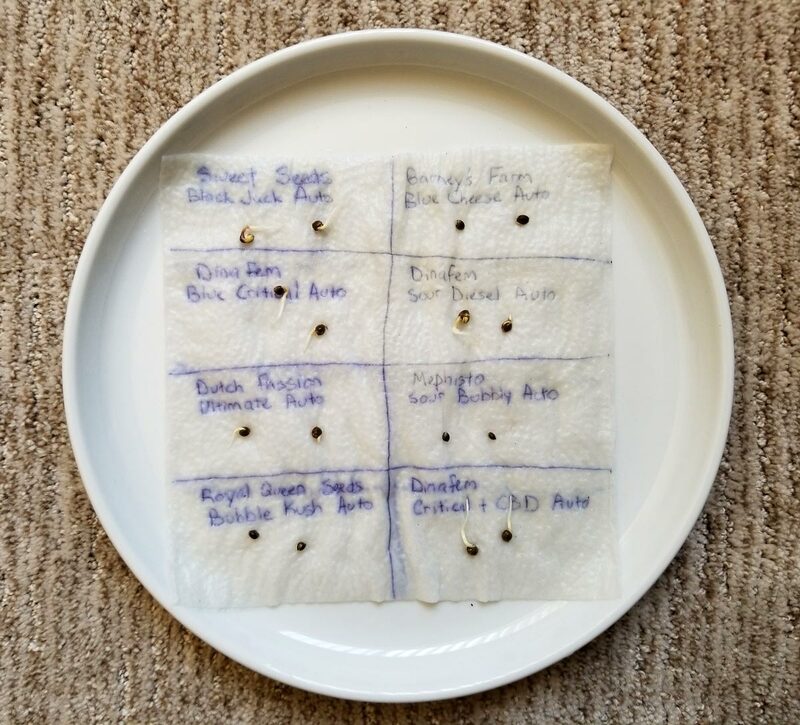 If you do use Rockwool, it’s recommended you germinate your seeds using another method like the paper towel method, then transplant your seeds to the Rockwool cubes after roots have already appeared. Even when following all the best practices, we just have not gotten great germination rates with Rockwool cubes, and it’s common for new seedlings not to make it. When we were using Rockwool (before we switched to Rapid Rooters), we usually lost at least 1 seed out of a batch of 6 or 8. I highly recommend using Rapid Rooters instead for your hydroponic application (or any grow setup), as they are much more user-friendly and tend to get far better germination rates. 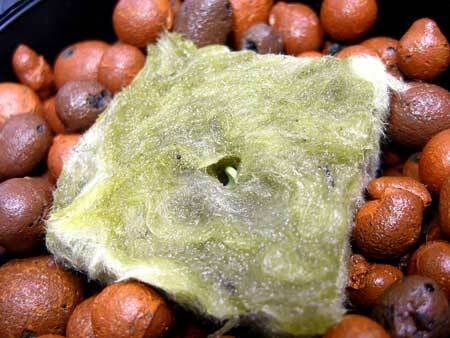 Jiffy Pellets are used in a similar way to Rockwool cubes, though these tend to get much better germination results. Jiffy pellets are not suitable for most hydroponic setups where the roots are grown directly in water, but Jiffy Pellets can be directly transferred into soil or coco coir. How to Use: Soak Jiffy pellets in warm water, which makes the pellets expand in size, as pictured below. Once the compressed Jiffy pellets have expanded in warm water, gently squeeze excess water from each pellet and you’re ready to go. Treat them the same as Rapid Rooters. Sometimes nature’s way is the easiest way. 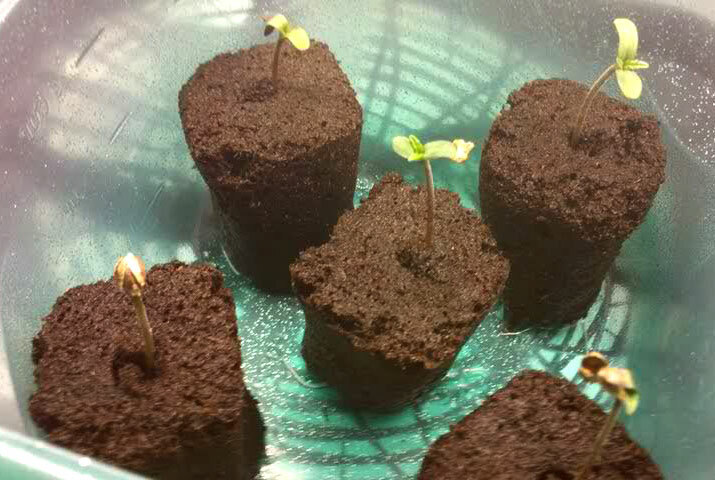 In nature, marijuana seedlings would sprout in soil, and they would emerge as their taproots start growing down. As a grower, you can also plant your seeds directly in your final growing medium. This works in all growing mediums, though some can be tougher than others. One of the biggest benefits of planting your seed directly in the growing medium is you don’t have to worry about shocking your young seedling during transplant. Because your seed is already in its final resting place, your new seedling will immediately start adjusting to the environment. Every time you transplant a sprouted seed, it can cause stress as the young plant needs to readjust its new surroundings. One option for growers is to use a tool which has been specifically designed to provide optimal germination conditions like this germination station with heat mat. You can make a DIY germination station at home by putting a plastic dome over a plate on a heating pad. There are benefits to the professionally made germination stations as they work very well and are pretty cheap to buy. When growers start their cannabis seedlings in a germination station, the seeds are usually germinated in a starter seedling cube. 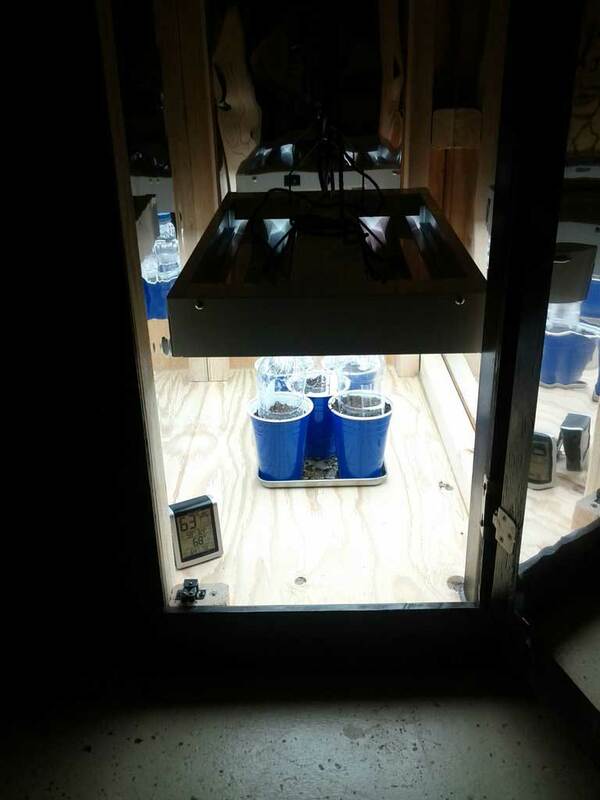 One of the advantages of starting seeds in starter cubes is your sprouted seeds can easily be transferred right to their next growing medium or container. I recommend Rapid Rooters as these starter cubes work great for cannabis seeds and can be used in any growing medium including hydroponics, soil, or coco coir. Other starter cubes include Jiffy Peat Pellets, and Rockwool cubes. 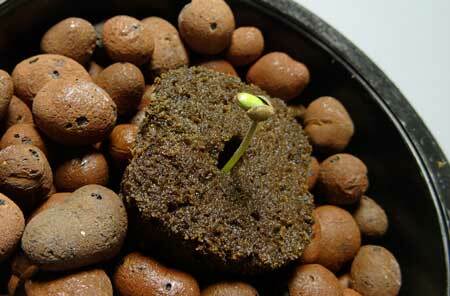 Once your seed has sprouted, just make a little hole in your growing medium, and place the entire pellet inside. Make sure growing medium is also moist yet not soaking, like your pellet or cube. 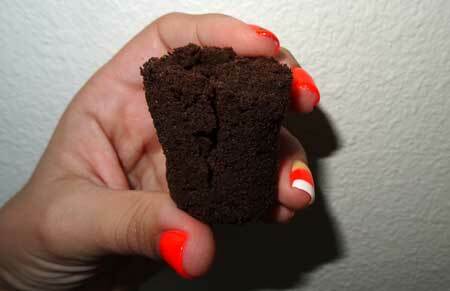 The roots will emerge from the bottom of the cube and burrow directly into your growing medium. 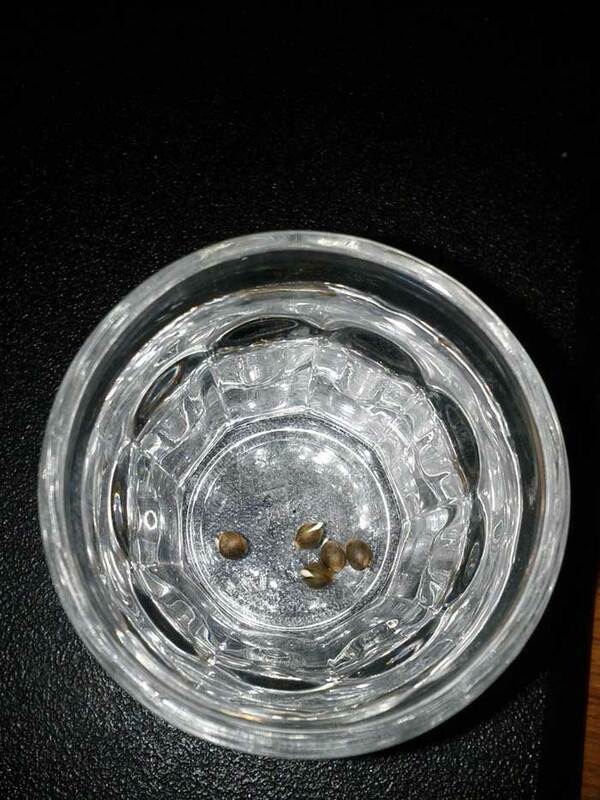 Another method to germinate marijuana seeds is to soak them overnight in slightly warm water, usually done in a glass drinking cup. This method is especially effective for seeds which have extra hard shells, or seeds which are older (more than a few years old). 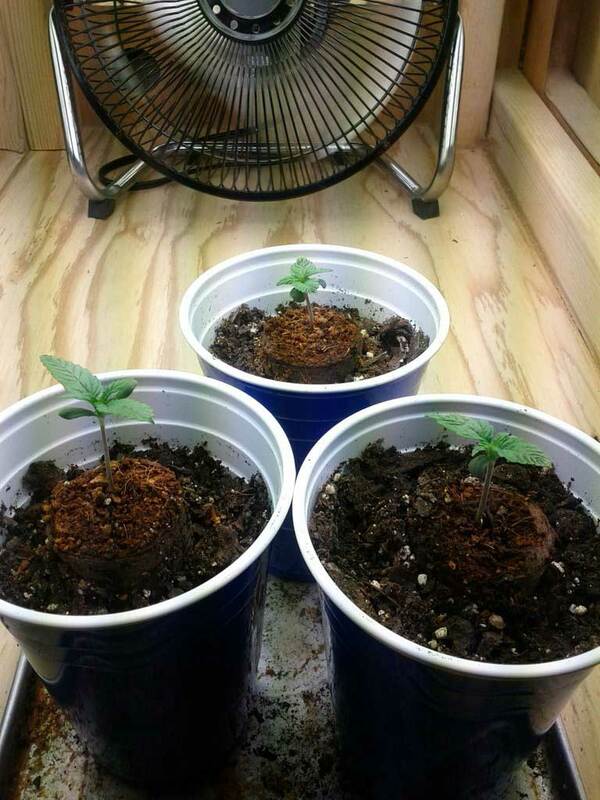 The warm overnight soaking can help “wake up” older seeds. 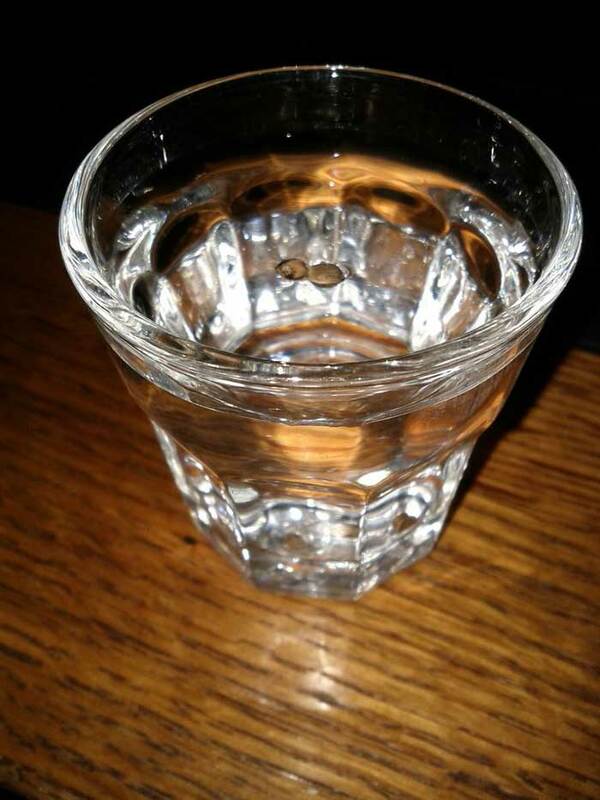 Most viable seeds will start out floating, and then eventually sink to the bottom of your glass after a few hours of soaking. 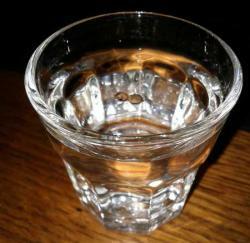 If soaked in a clear drinking glass, you will see when the little white tap root first breaks through the shell. Some seeds take longer than others to sprout. Especially older seeds tend to need longer to pierce through their shell. However, if seeds are left soaking too long, and haven’t yet sprouted, they can drown. Therefore, do not leave seeds soaking in water for more than 24-32 hours. After 24 hours, I recommend putting any still-ungerminated seeds in a warm, moist place to finish germinating. One way to germinate seeds is to wet a paper towel and then fold your seeds in it, then leave the paper towel in a warm place. Use cheap paper towels! For some reason, the really cheap paper towels work best because they’re so non-porous. Seeds and their roots lay on top without getting stuck to anything. This is important! The more expensive “cloth-like” paper towels (like Viva brand) aren’t good for germination because the roots actually grow into them instead of laying on top. 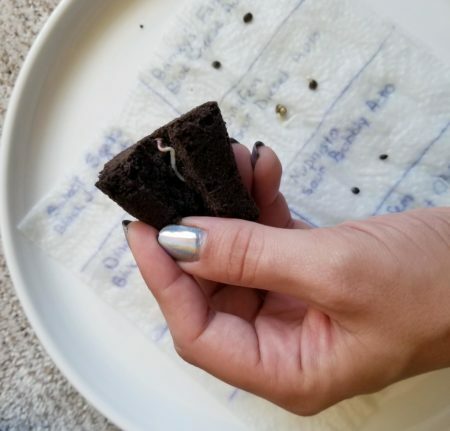 If you germinate your seeds in a paper towel, there is the risk of hurting the tap root (the little white root that grows out of your seeds) when moving the sprouted seeds so make sure you are careful when you’re checking to see if the seeds sprouted. There is also the possibility of having the towel dry out which will kill your new seeds so I recommend putting your paper towel under an upside down bowl or between two paper (or regular) plates. Check on germinating seeds once every 12 hours or so (don’t disturb them or their roots). You can plant any seeds which have sprouted right away, or leave them for another day or two, to let the others keep up. 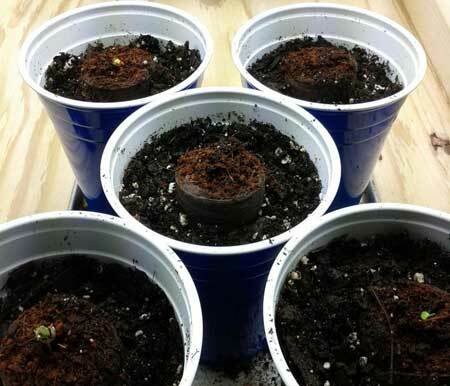 After you see that your cannabis seeds have sprouted, you should plant them right away. You don’t want to touch the little white taproot with your fingers, so either carefully move the seeds, or use tweezers. If you do touch or break the root, the seedling may still survive, but any damage to the root will definitely stunt and slow down growth right in the beginning. Plant seeds so that the white root faces downward, about a knuckle deep into your growing medium. The top of the seed should be just below the surface of your growing medium. It can take anywhere from a couple of hours to a couple of days before you see the young seedling emerge from the soil or growing medium. 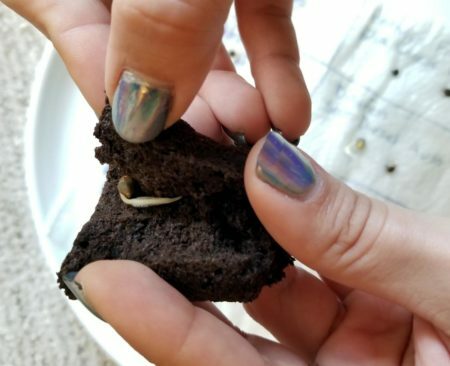 If your marijuana seedling hasn’t sprouted from the soil within 10 days after being placed root-down, it probably isn’t going to make it 🙁 Even with the best practices and the best seeds, you will occasionally lose a seed. Many times it has nothing to do with you! First sign of taproots. These are ready to be planted! Rapid Rooters are nice, but not necessary. You can use them before you transfer your seedlings to their final container. 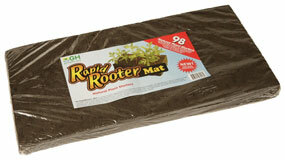 The Rapid Rooter should be cut open lengthwise if you plan on using them for germinated seeds. I use big scissors. Gently place the germinated seed inside, root down. Place the seed close to the surface so it doesn’t have far to go. Sometimes you’ll have a taproot that is curved or bent. You don’t want to try to straighten it out! Open the Rapid Rooter you split, and lay the germinated seed down gently. The seed and root will naturally lay on the flattest side. Slowly close the Rapid Rooter, and you’ll see that the bent parts of the root will end up in the “crack” of the Rapid Rooter from where you cut to split it open from the side. After closing a Rapid Rooter, it’s hard to tell it’s been opened. The texture of Rapid Rooters causes the seeds to stay in place and not “fall down” further into the hole once you’ve got it closed. Sometimes the shell can get stuck on the seedling, but it will often fall off on its own. If it seems really stuck, you can help the seedling by gently removing it. Within the first week of germinating seeds, you will notice that some seeds germinate right away and others take a little bit longer. This can be caused by a lot of things, from the age of the seed (old seeds have worse germination rates and tend to take longer) to simple chance. The amount of time does not necessarily have anything to do with how healthy your plant will be in the long run. 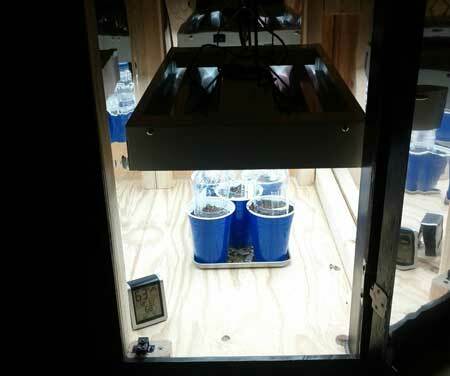 Once your seeds are safely planted, you can turn on your grow light. The heat from the lamp improves germination rates, and the light can help your new cannabis seedlings open their first set of leaves. In fact, the first set of leaves will often stay yellow until they get light. If you will be transplanting your seedlings again, avoid transplanting until they are well established and have a couple of sets of leaves (nodes). 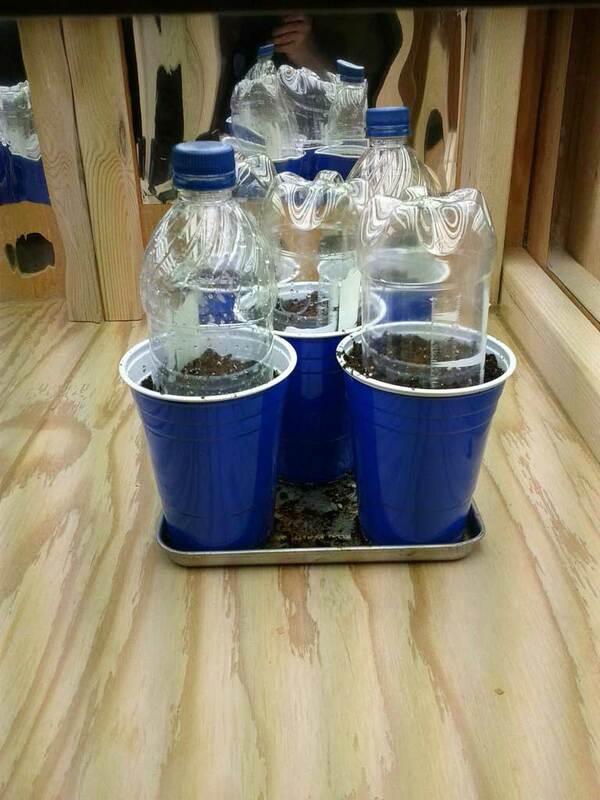 Some growers will plant seedlings in a growing medium in a solo cup or peat pot, so they can just cut away the cup for easy transplanting. When you move seedlings around a lot, it stresses them out and potentially stunts their growth. Too much stress can even kill them. So try to plan from the beginning so that you move your seedlings around as little as possible. once they get bigger, they are a lot more hardy and can stand a lot more stress and movement. If you want, you can put bottles on top to help retain extra humidity (like a cheap humidity dome). It’s a steady 85 degrees F in there, no idea about the humidity in the bottles. 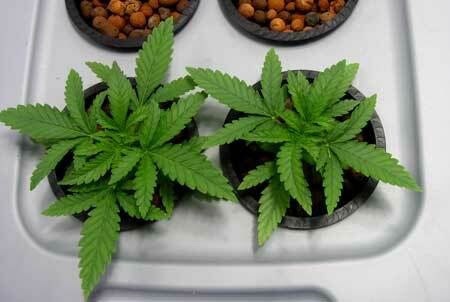 During the first few weeks of a young marijuana plant’s life, you have to be careful. Marijuana seedlings, especially seeds from some of the most potent strains, tend to be a bit delicate. Seedlings definitely won’t be able to withstand full-strength grow lights or nutrients. They need to have a moist environment, but also can easily be drowned or overwatered. If you’re planting in soil, start with a balanced potting soil that doesn’t contain extra nutrients. I recommend Happy Frog potting soil mix for young cannabis seedlings, but any plain potting mix from your local garden store will do. Never use Miracle-Gro soil or any soil that has “time-released” nutrients already mixed in. After your plants have grown a few sets of leaves, you can transfer them to a stronger potting mix that contains higher levels of nutrients like Fox Farms Ocean Forest soil, or you can start supplementing with cannabis soil nutrients. Don’t want to use nutrients? Learn how to mix up your own super soil so it has all the nutrients your cannabis plants will need! 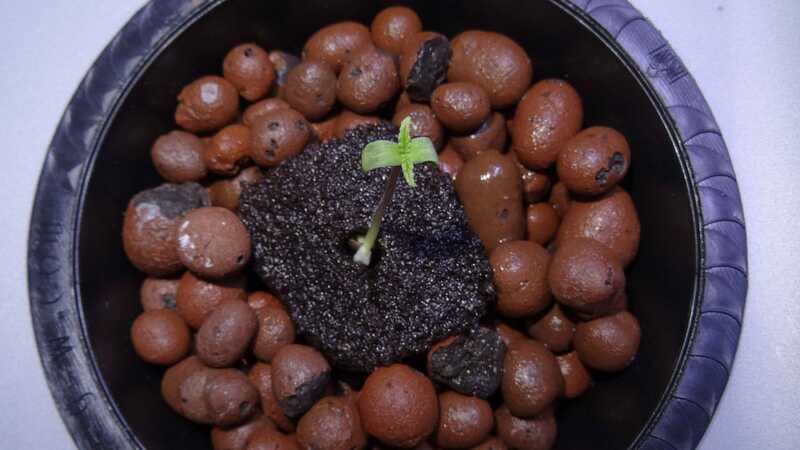 If you’re planting in coco coir, a soilless medium, or hydroponics, only add cannabis nutrients at seedling strength, or 1/4 the regular strength, until your plants have grown a few sets of leaves. Then you can slowly start working your way up to full strength nutrient levels. With young marijuana seedlings, less is more. You’re trying to give young plants a very small dose of nutrients at first. 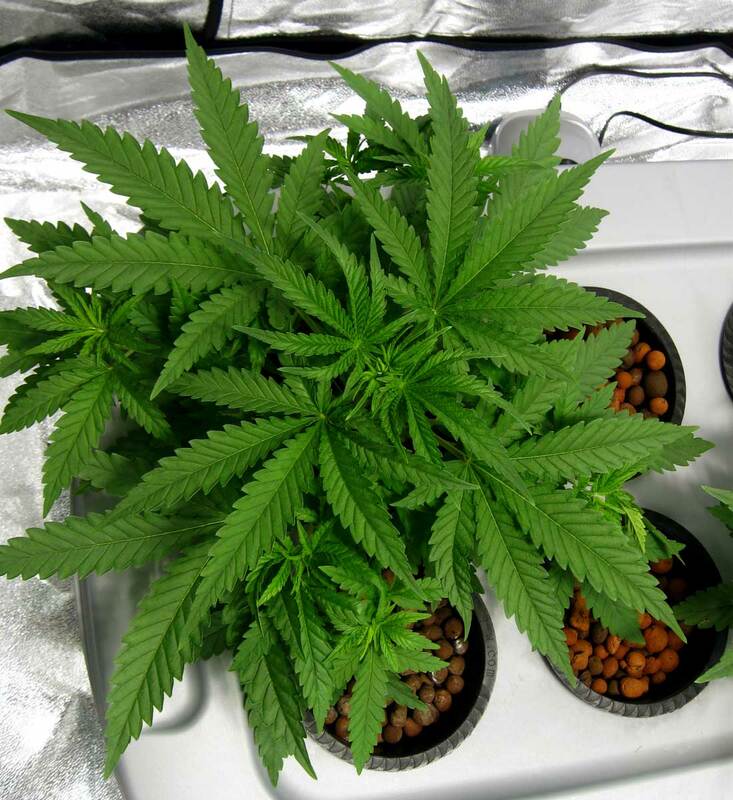 However, even with young marijuana seedlings, the pH of your water and growing medium is important. Some growers get lucky and happen to have water with the right pH, but if you’re noticing deficiencies and problems with your seedlings, definitely take the time to understand about marijuana root pH and how it affects the plant’s overall health. 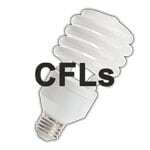 Keep CFLs or fluorescent lights about 6 inches away from your seedlings. Place your hand where the leaves are to make sure it doesn’t feel too hot. If it’s hot for your after 10 seconds, it’s too hot for your plants. Once your seedlings have developed their first two sets of leaves, then you can move these lights as close as 2 inches away as long as the lights aren’t too hot. Make sure to keep a close eye on your seedlings to ensure they don’t grow too close to the grow lights and burn themselves. Seedlings can grow fast, and many growers have been surprised to find plants have actually grown into the light overnight. If new seedlings are showing signs of stress, try moving the lights further away and see if that helps. Once marijuana seedlings are about fourteen days old, they’re ready to start being treated as if they’re in the vegetative stage. If you look closely at the above plant, you can see that some of the newer leaves on this plant actually have 9 fingers. It is normal for there to be some variation between leaves – some plants will grow leaves with 11 or even 13 fingers. But the above guide will give you a general idea of what to expect. 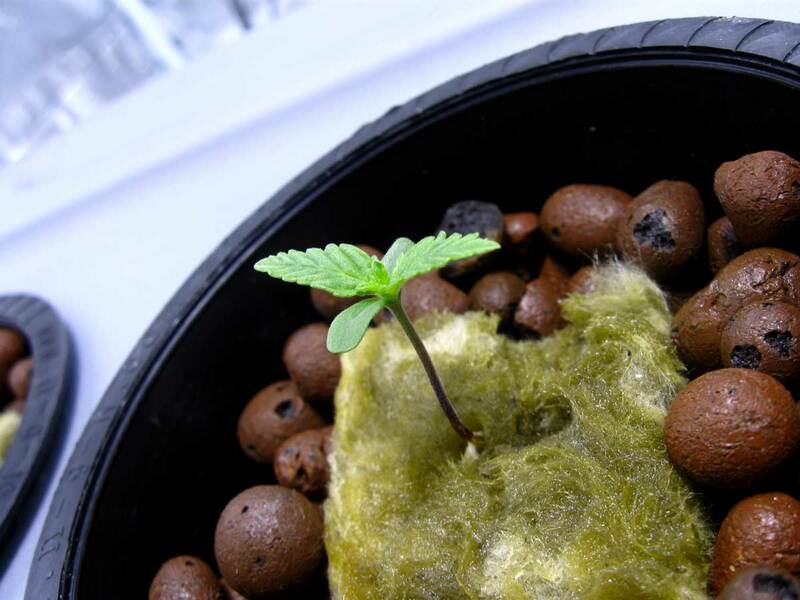 Once your cannabis seedling is about fourteen days old, it’s ready to start being treated as if in the vegetative stage. Make sure you learn about plant training techniques to make the most of your time in the vegetative stage! Wait! My seed is growing upside down with the roots up; what do I do? As long as the roots of a cannabis seedling are able to grow down, they will. Roots never grow upward on their own. Seedlings can sense the difference between up and down. Roots always try to grow down. Roots never grow upwards. 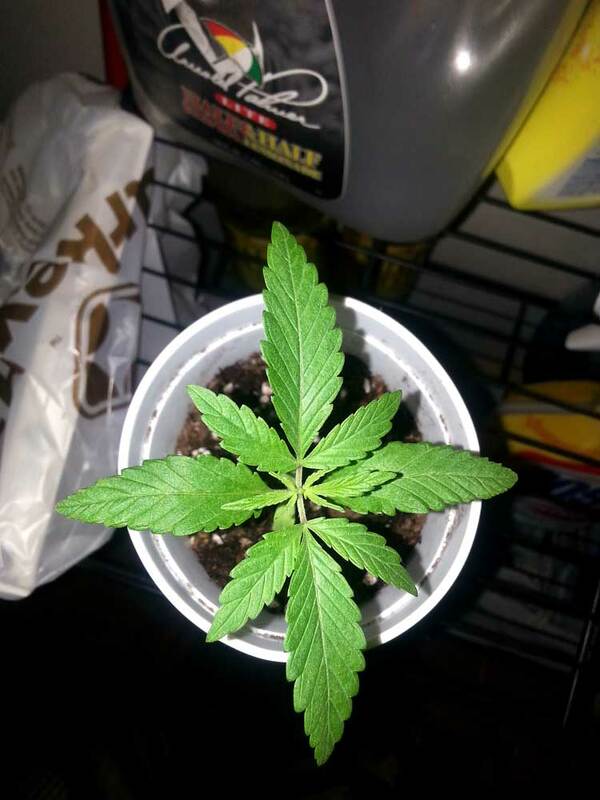 So how come sometimes it looks like a cannabis plant is growing with its roots pointing up? Cannabis seeds can look a bit different when germinating. When in doubt, always wait a few days to see if leaves appear before you try to interfere. Sometimes the stem of a brand new cannabis seedling can look like the roots growing out the top. But if you wait and watch, you’ll see that it’s all part of the plan. Hope these pics help someone! As the seedling emerges you’ll be able to see the leaves (sometimes it will still have the seed stuck on the first leaves, like in the picture above). 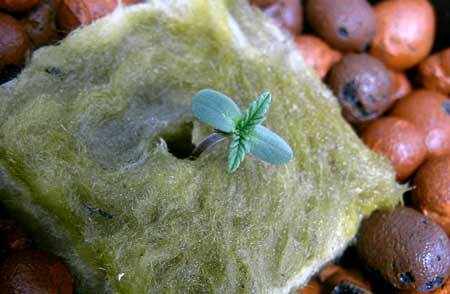 The cotyledons (first, round leaves) unfurl, and then the regular cannabis leaves between to grow. 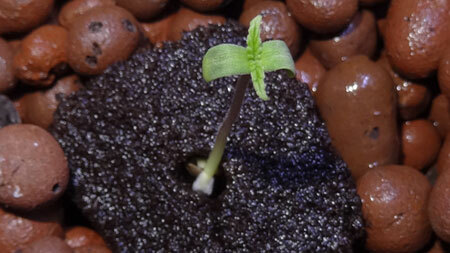 Here’s another view of that same seedling from above. Even though it may have looked a bit weird at first, this seedling is completely normal and will grow just fine from now on. A general guide is to have about 2 gallons per 12″ of height. This isn’t perfect since plants often grow differently, but this is a good rule of thumb. When in doubt, get a bigger final container size as opposed to a smaller one. Plants that get rootbound from being in a too-small container will grow more slowly and be prone to problems. It’s not good to transfer plants during the flowering/budding stage, so you want to have your cannabis plants in their final container at least 2 weeks before the beginning of flowering/budding. How do I get my cannabis plants to start flowering? The reason you want to start with a small container is that your plant’s young roots thrive on oxygen. Cannabis plant roots “breathe” oxygen, just like we breathe air, and it’s important that young cannabis roots get plenty of oxygen so the plant can grow as fast as possible. However, young plant roots do not drink much water yet. When you water seedlings or clones in a very big container, they will use up all the oxygen quickly, and the large size of the container will prevent the growing medium from drying out. A big plant will drink up all the water quickly, but with seedlings, you’re basically waiting for the growing medium to dry out by itself. While you’re waiting for the container to dry out, your cannabis roots are sitting in a wet environment and not getting much oxygen, slowing down their growth rates. Poke holes in the bottom of your cup so water can drain out easily! By planting young seeds in a small container with holes in the bottom, the growing medium will dry out much more quickly, allowing you to water more often. The young cannabis will get plenty of oxygen and water. 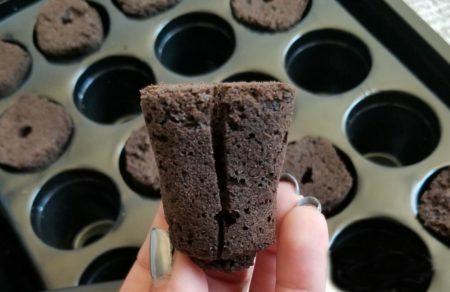 If you don’t want to have to transplant your young plants, you can start them in a seedling plug or cube and wait until you start seeing roots come out the bottom. At that point, they will be ready to be transferred to a larger container. What happens if I plant seeds or clones in a big container? 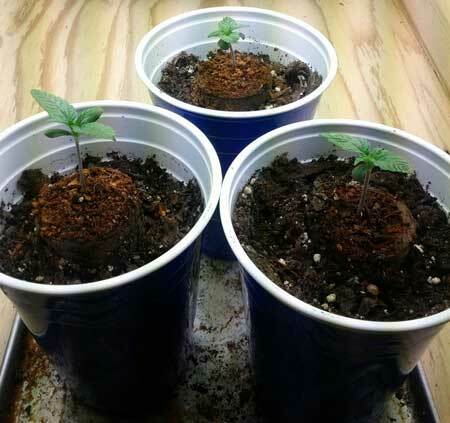 Your cannabis seedlings and clones will definitely survive in a bigger container; they just won’t grow as fast for the first few days or weeks because they aren’t getting as much oxygen. With a bigger container, you will need to wait longer between waterings, and during that time your plant roots will be getting reduced oxygen. If you’ve planted your young plant in a large container, try to give only a little bit of water at a time (enough to wet the area around the seedling roots) until the plant is growing vigorously. 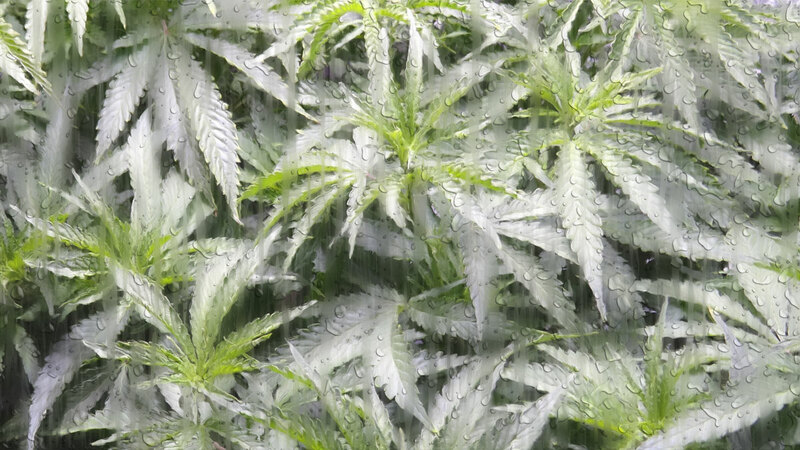 Once the plant has grown a few sets of leaves, you should start watering cannabis normally so that water drains out the bottom. One of the advantages of starting young plants in a big container is you won’t have to transfer them to bigger containers as they get older. Teach me the basics of growing marijuana! How long does it take from seed to harvest? What grow lights are good for growing marijuana indoors?